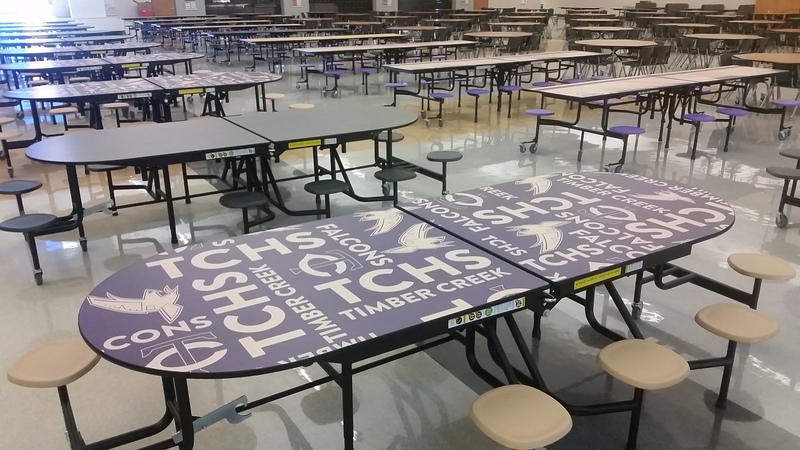 New colorful lunch tables show Timber Creek graphics and branding. Timber Creek High School students have seen many colorful improvements as they start the school year. These improvements include more new and colorful lunch tables in the cafeteria, signs hanging up in each hall, booths, a bar area in the main hallway, and other elements. Timber Creek Principal Todd Tunnell described the goal of the improvements during an interview with the Talon. As for further future plans, Tunnell talked about wanting a more colorful environment for Timber Creek High School. Even small changes like soft seating in common areas to add comfort for students is an idea that has been stirring around, as well as more TV screens, and other elements. One location that has received this environmental improvement is the main lobby or “fishbowl” area near attendance and counseling. Looking into the new school year, administration is making continuing the success of the students a priority. Every year, the school is presented with a large amount of new incoming students, whether it be freshmen or new students from other schools or areas. Although Tunnell mentioned how it was a slight challenge to keep up with the growing population of the students, the overall percentage of students who have done well academically has been fantastic. Tunnell says he wants the students to continue that very success. The overall desire by administration of Keller ISD is to create a relaxing and comfortable environment for students to they can maintain the success that the school has had. Kristina Dargan is a student reporter for the Timber Creek Talon.